There is a certain mystique, a sense of intrigue, associated with castles and palaces of yore. The common man is attracted to them immensely in search of the fabled exotic lives that royalty are supposed to have lead. And Kerala has no dearth of these palaces. The princely state of Travancore has its fair share of palaces scattered all over which were used as venues for entertaining dignitaries or as summer residences. However, one gross difference exists between palaces of northern India and those of the Travancore rulers. The mogul-era palaces in the north come highly embellished and are very elaborate structures made up of materials imported from far and wide. In contrast, the palaces found in Kerala are examples of simplicity and elegance. 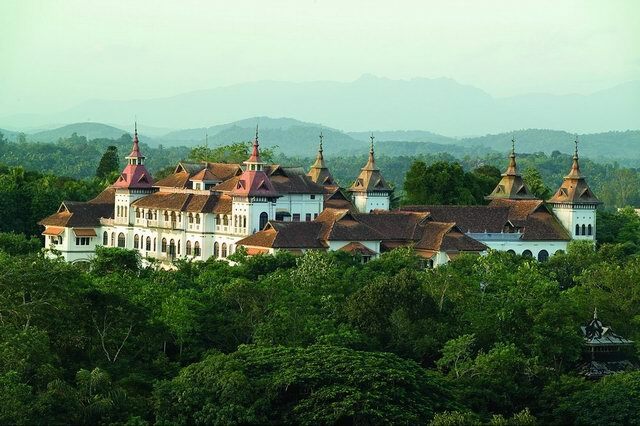 An example is the Kowdiar palace built in 1934 by Maharaja Sree Chithira Thirunal for the wedding of his only sister –Maharani Karthika Thirunal Lakshmi Bai with Lt. Col. G.V. Raja. This palace is considered to be amongst the finest palaces in Kerala and is located within its capital city, Thiruvananthapuram (Trivandrum). The palace is simple in design and takes pride in following the typical Kerala architectural style that relies heavily on locally sourced wood. One of the amazing features here is an elevator (lift) made up entirely of wood. The palace is also endowed with ornately carved wooden beams and pillars as well as six beautiful steeples that herald the palaces presence across the city’s skyline. The palace is a three-storied structure with over 150 rooms that once rang with the pitter-patter of numerous tiny feet with the heavier ones of their nannies behind them. Alas, the palace is mostly silent now with just a few rooms in use by members of the current erstwhile royal family of Travancore. For this reason, entry into the palace is mostly restricted. The palace nestles in acres of resplendent sprawling green gardens where the last erstwhile Maharaja of Travancore, Raja Sree Chithira Thirunal Balarama Varma is also buried. The royal family was well-known for their love of arts, music and literature and many of the colleges and academies they set-up to promote this are still in functional existence. Interestingly, the location of the palace is named after the palace and also known as Kowdiar. Today, it is the home of the elite, the place where the ‘who’s who’ of society resides along with posh restaurants and high-end shopping complexes. Kowdiar is very ideally located as it is close to all the important facilities the city has to offer. And everyone aspires for an address here!